Human flesh has moral value. We see this when friends fall ill and we are saddened by their bodily suffering, when accidents happen and bodily functions are impaired, when we mourn the dead and care for their remains. In each of these instances we are treating the human body, and the proper functioning of its parts according to the dignity it possesses: as having importance, as meaning something, as valuable. We see its suffering, its demise, its lifelessness, as a tragedy. What happens in the context of abortion, then, is likewise indicative of the moral value of human flesh. Precisely because abortion requires the dismemberment of a body, it also reveals to us the tragic end of a human life. It follows from the reality that human organs are procured for research through abortion, that abortion is not simply a matter of personal choice, or reducible to other euphemistic sound bites, but the gruesome and tragic ending of human lives. Philosophically we know that human flesh, human organs, belong to human bodies, and that these bodies belong to living persons. To distinguish falsely between ‘fetal tissue’ and the human persons this tissue belongs to is easy to do if we do not discuss the true identity of what we call the ‘remains of abortion’. But when suddenly a nation awakens to headlines on the provision of ‘fetal tissue’ for research, and hears what procuring this tissue entails, the anesthesia wears off, and we are given a harrowing insight into the gruesome reality of what we superficially call abortion: the procured, protected destruction of innocent lives, carried out by deliberate human choice, whose bodies are then further desecrated and used for purported scientific gain. The recent revelations on the procurement of so-called ‘fetal tissue’ have awakened the conscience of a nation to reflect precisely on the tragic nature of the abortion procedure. Stripped from debates on ‘freedom of choice’, the harsh truth we have been anesthetized to is the truth of human dismemberment that take place in each case of ‘pregnancy termination’: strategic dismemberment to procure intact specimens for the sake of scientific experimentation using very specific human organs. The unspoken truth of this targeted destruction of life is the even harder medical reality that one cannot procure ‘quality fetal tissue’ without ‘harvesting’ it within minutes of death. Which means that the sanitized abortion clinics we look at as integral to the fabric of our society, may well be delivering babies still partially alive to ensure quality ‘specimens’. The time frame we are speaking about is five minutes. Five minutes stand between living human beings and ‘quality fetal tissue specimens’. None of this should really shock us, as we all fundamentally know what abortion entails. Whatever we choose to think about it, one thing is evident: human flesh has value. If we are alive and well, we wish to preserve the health of the body. If we are ill, we appeal to medicine to mitigate the effects of illness on the body. We honor the bodies of the dead with proper burial rites. It is odd, then, that when it comes to the unborn, it becomes normative to select parts of the human body and use them for presumed medical advancement. The price of such ‘medical advancement’ is indeed high, and we are complicit in the moral cost is we choose to remain silent about it. There is an ethical standard that should govern scientific research: the standard of the protection of each human life. The ‘product’ of abortion is not simply strategically selected body parts. The product of abortion is firstly the death of a human being. It is misery that we have more social use for fetal tissue specimens than we do for the persons these specimens come from. In each of these instances, the flesh, the human body has moral value, and it has social value. Public denial of this is possible only by inverting reality and presenting lies as truth in a litany of deceit. Any society that does not look to this bloodshed as the impoverishment of evil has already lost its soul. The common good of society depends on this truth and on the preservation of human life. In contrast to such waste, we see the elevation of human flesh made evident in the Incarnation. Human flesh has Incarnate value. Christ was once a developing embryo, a fetus in the womb of a Woman. It is this particular detail in the history of Redemption that set Redemption in motion. An embryonic Redeemer is the God we adore as Savior of the world. The striking helplessness of Christ in the womb is the iconic standard through which we must judge the current waste of human life. God holds human flesh in such regard that He makes it the instrument of our salvation. Made in the image of God, man is redeemed by God who takes on human flesh as a helpless fetus in a womb. As we show compassion for the many who have and provide abortions, for those who suffer its life-altering consequences, for those hidden lives that end before birth in the abortion clinics of our land, we must reflect on the reality of Christ Incarnate, whose sole reason for entering our existence, in our human flesh, was so that he could offer His body for our salvation on the wood of the Cross. At the time of Christ’s birth, it was the blood of the Innocents that first bore witness to the divinity of the Infant God. Their helplessness, and the heroic witness they bore as Herod slaughtered them was the first sign pointing to the salvation that would flow thorough the shedding of Christ’s own Blood on Calvary. We must return to this moment often, as we witness the modern bloodshed that many prefer to ignore. No longer is it possible to flee into Egypt. Herod is everywhere. 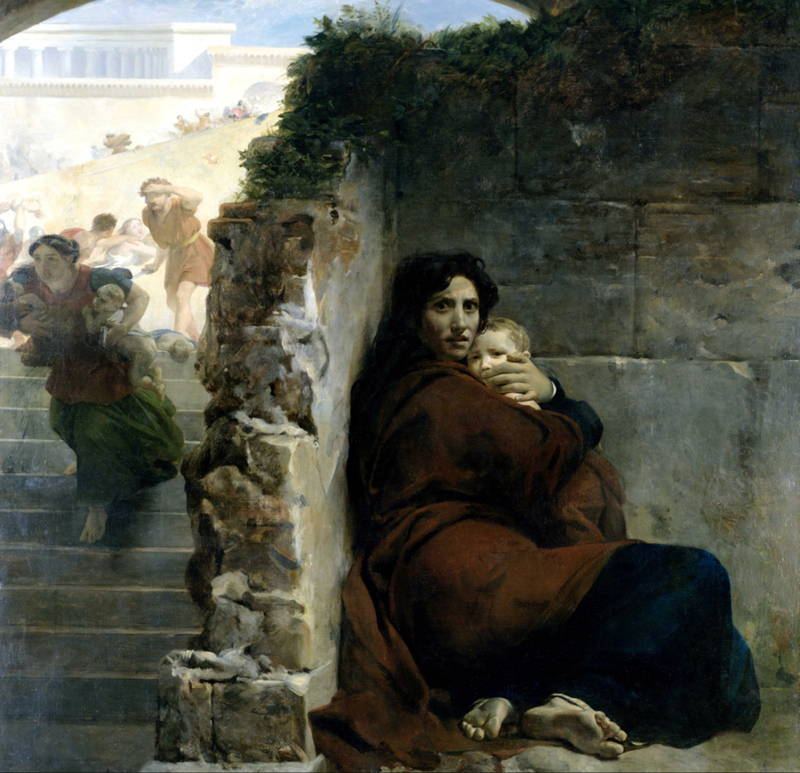 It will be the blood of the hidden innocents dying in our cities by abortion, whose brief lives witness to the truth about the miracle of each human life, that will again be seed of the Gospel in the deserts of moral death we are traversing as a people still in exile. Their cry for justice cannot go unheard. The modern Samaritan may not find men left dying on the side of the road whose wounds he can bathe in wine and soothe in oil. Along the byways of our cities, the modern Samaritan will find the woman who newly mourns the loss of a child’s life she has ended; the man who knowing fetal body parts are used for research relives his past and wonders what happened to the mortal remains of his baby; the doctor who regrets the termination of countless pregnancies and now realizes those where the termination of countless human lives. For each of these dying souls we must find room in an inn — a place of restoration where wounds are not dressed with wine, but with the unfailing work of Mercy that was once a Fetus in a womb.